Matsushima has been long celebrated as a place of romance, spirituality, and elegance. Explore the 260 small pine-covered islands that rise from the pale blue sea. Even the haiku master Matsuo Basho was left at a loss for words. 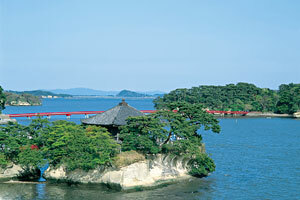 Matsushima’s landscape was seen as a sacred place which approached the beauty of paradise. The beauty and spiritual power of Matsushima attracted great monks, artists, and powerful rulers. The best way to appreciate Matsushima is by boat. 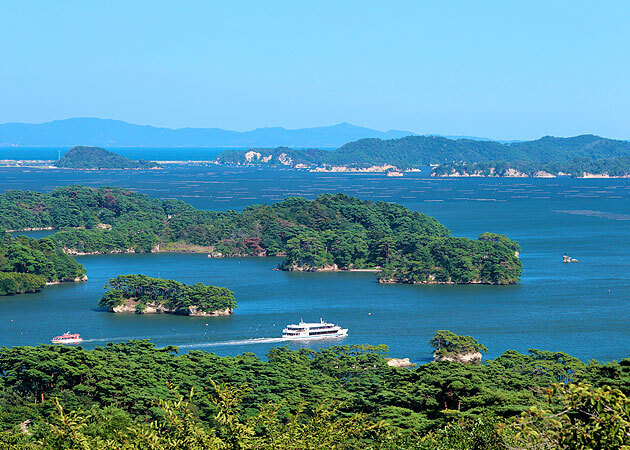 Daily cruises take passengers around Matsushima Bay, passing by islands like Niojima and Kanejima which have been carved into delicate and intriguing shapes by the wind and water. From December to March a cruise company offers special Oyster Lunch Cruises on weekends. In summer there are also special small boat tours between Matsushima and the dramatic stark white Sagakei cliffs in neighboring Oku-Matsushima (Higashi-Matsushima City.) 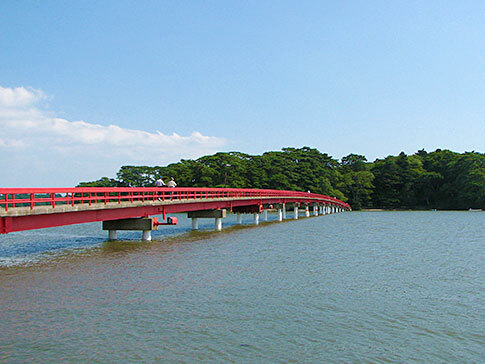 From land, Matsushima can be appreciated from the Four Panoramic Views which offer visitors very different perspectives on the bay. They highlight the mystery, beauty, and dynamism of the bay and its islands. Each direction offers a perfect balance of form and color as the small green isles of pine appear to float on the sea under a never-ending expanse of sky. On nights with a full moon, just after moonrise a golden wave of moonlight forms a glowing road over the bay to the moon. As the moon approaches its highest point, the road shifts from gold to silver. In this shimmering white world the islands and pine trees exist only as shadows drawn against the sky and water. 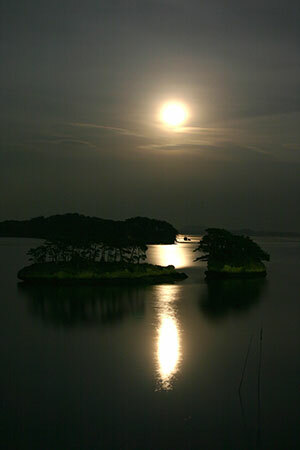 Come enjoy the serenity of Matsushima’s sacred landscape by moonlight. Matsushima opens Kanrantei Tea House for special moon viewing events where guests can watch the moon rise over Fukuurajima Island.The long,red Fukuurabashi Bridge and Godaido Temple are also illuminated at night. Zuiganji Temple is one of the greatest Zen Buddhist temples in northeastern Japan and is designated as a National Treasure. It was established in 828 by Jikaku Taishi, and the temple as we know it today is the result of renovations undertaken in 1609 by Date Masamune, ruler of the Sendai area. It took 130 skilled craftsmen five years to complete the construction using lumber from Mt. Kumano in the distant Wakayama Prefecture. Highlights of Zuiganji Temple include the sando approach that is lined with cedar trees and mysterious caves where monks once lived and prayed. The main hall, or hondo, reopened in April 2016 and features gorgeous depictions of the natural world painted on sliding doors. The ornate Peacock Room is designated as a National Treasure. Date Mitsumune, the grandson of Date Masamune, is buried next to Zuiganji Temple. Having an atmosphere as calm as a Zen temple, Entsuin Temple houses the mausoleum Sankeiden (a National Important Cultural Property) which is painted with gerberas and western roses. It is because of this that the temple also boasts a luxurious rose garden. It is the first temple on the Sanriku 33 Kannon pilgrimage. Entsuin's Fall Light Up is well known throughout the entire region. 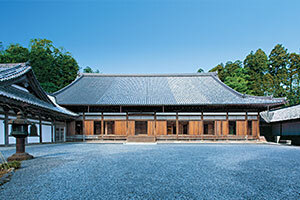 Godaido is a small worship hall said to be built in 807AD by Sakanoue Tamamuramaro. He was sent by the Imperial Court in Kyoto to conquer the Tohoku region. In 828AD, the founder of Zuiganji Temple, Jikaku Taishi, enshrined five Buddhist statues in this temple, which gave it its name. Godaido was reconstructed in its present form by Date Masamune in 1604 and was first building in the Tohoku region to be built in the Momoyama style of architecture. 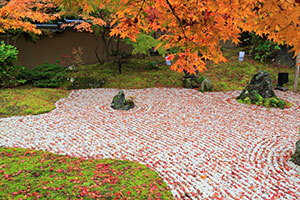 The principal images enshrined in Godaido are only available for public viewing once every 33 years. Godaido is designated as a National Important Cultural Asset. This tea house by the bay was once part of Fushimi-Momoyama Castle in Kyoto. It was given to the Date family by Toyotomi Hideyoshi. 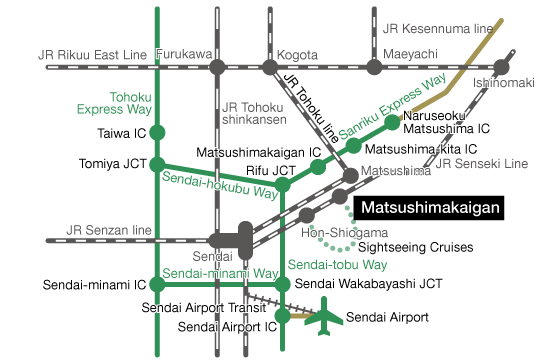 Masamune’s son Tadamune moved Kanrantei to its present location in 1645. 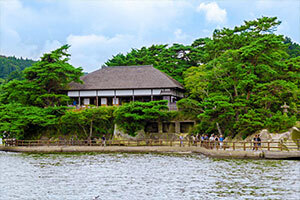 Kanrantei was used as a villa for the Date family and their guests to enjoy the cool of the evening and watch the moon rise over Matsushima Bay. Today the tea house and neighboring museum are town-owned properties. Guests can enjoy green tea and seasonal sweets as they watch the ripples on Matsushima Bay, just as the Date family once did. It is also open for special evening events during full moons. Matsushima was once a memorial place for the dead, so many caves here have been carved with images of pagodas or Jizo, the bodhisattva of children, travelers, and the underworld. 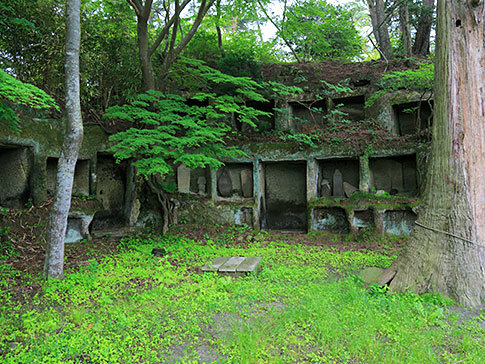 50 caves still exist on Oshima Island today, although it is said that there were once 108. Fukuurajima is an island of about 6 hectares (15acres), and is connected by a red bridge called Fukuurabashi which is 252m (827ft) long. Called a botanical treasure island, it is rich in many different species of flowers, plants, and trees. There are several different paths and observatories on the island. 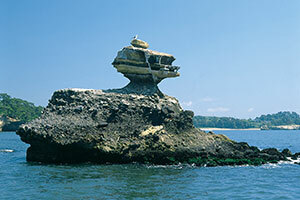 The white rocks seen on this cruise have been carved by wild waves, and the open sea displays a dynamic beauty. Amanohashidate Tourism Association, Hatsukaichi City Department of Environment and Industries, Miyajima Tourist Association.